Using .NET Micro Framework v4.0, Device Solutions' Board Support Package and GCC. Current release of the board support package does not support the Solution Wizard, so we have to do the integration manually. To see more detailed and advanced interop walkthrough including Solution Wizard, check out Steve's Using Interop in the .NET Micro Framework V3.0 blog. If you don't have yet, install a Visual Studio and .NET Micro Framework SDK if you want to debug our managed interop test. To keep things free, I will use the express edition. You need booth C# and C++. SDK is available here. C++ in Visual Studio 2010 RC does not work yet. You need a 2008 version of C++, sorry. Install the porting kit. You can download it at Microsoft Download Center, the 4.0.1681.0 version is available here (zipped, approx. 40 MB) – start the installation by running MicroFrameworkPK.MSI. I strongly recommend you to keep the default installation path (usually C:\MicroFrameworkPK_v4_0), the native toolchains are usually not very friendly to spaces and non-ASCII characters. Make sure you are installing a supported version of the porting kit for your board support package. There are no extra options in the Custom installation other than changing the installation path. Important: Install the network (150 MB) and cryptographic (0.5 MB) libraries. Meridian has the ARM architecture, so you need the ARM version (again, run the MSI files). If you omit this step, everything will still work up to the point where you download your firmware to the device. Then the device will attempt to start but will always abort shortly. Again, keep the default path (usually the same as porting kit installation); no other extra options. Install the board support package. You can download it at Device Solutions' download page. Keep the same install path as the porting kit had, the board support package will integrate into it. Now if you check the Device Solutions BSP documentation which got installed into the Start menu under Device Solutions BSP, you will see we have to set the PowerShell to run unsigned scripts (Getting Started\Installing the BSP). In the Start menu, run Windows PowerShell with administrator rights. A blue command window will appear. Type set-executionpolicy remotesigned, press enter and confirm the are-you-sure-prompt. On Windows versions prior Windows Vista resp. Windows Server 2008, you need to install the PowerShell. You can find download links in KB 968929. If you canot find Windows PowerShell in the Start menu, it is located under the Accessories folder. Install the native toolchain. The board support package (BSP) supports ARM RVDS 3.1 and GCC 4.2, versions are important. We are keeping things free today, so we will stick with the GCC. In the mentioned Device Solutions BSP Documentation, there is a link to the correct version of GCC, which is this one (70 MB). Important: change the installation path to C:\CodeSourcery or similar easy path without spaces! Welcome to the native embedded world. Don't get confused seeing G++, that stands for GNU I guess. From now on, I suppose you have installed the porting kit, network libraries, cryptographic libraries and BSP into C:\MicroFrameworkPK_v4_0 folder, and the GCC into C:\CodeSourcery folder. If you have choosed different directories, replace them in the following text accordingly. Start the command prompt and navigate to the porting kit directory, e.g. C:\MicroFrameworkPK_v4_0. For those who don't know the trick, you can type cd m and press the Tab key to complete the directory name. setting vars for GCC compiler. If you are using the RVDS compiler, use setenv_RVDS3.1 C:\CodeSourcery instead. Now let's build the porting kit. Type msbuild build.dirproj /p:flavor=release and press enter. Be patient, it took over 15 minutes on my 2 × 2.16 GHz / 3 GB RAM. You should see no errors, but couple of warnings (I had 171). You can hit the Pause key anytime to see the output. To increase the number of lines you can scroll through, right click on the command prompt window caption and choose Properties from the menu. On the Layout tab, Screen Buffer Size group, increase the Height value. The maximum is 9999, but this doesn't cover the whole build output anyway. Don't be afraid seeing couple of red lines during the build. These are probably caused by not having the source code for the companion libraries, but they do not cause the build to fail. If you encountered errors, make sure you had set the environment variables and the setenv_gcc batch confirmed the C++ version you are using. When in doubts, feel free to completely delete the BuildOutput folder and try to build again. If it does not help, you can try e-mailing me the errors. Build the RAM version of Tahoe-II firmware. As the documentation says, we need a RAM version of the bootloader for the update tool to work (the bootloader can't update itself when it's in flash). Type buildmf TAHOEII RAM and press enter. This one took me almost 3 minutes, no errors, 92 warnings. I've chosen Tahoe-II as my target, because it has a display so I can easily see if something goes wrong. If you build firmware for different devices, use an appropriate parameter instead, e.g. MERIDIANP or TAHOE. And last one is easy: Create a folder for your interop projects, e.g. 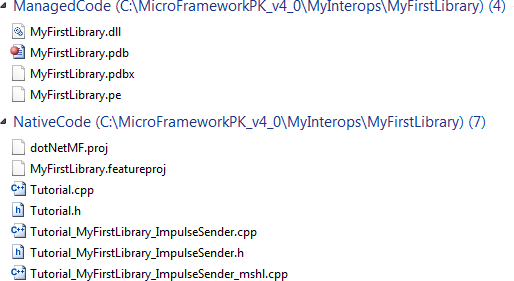 C:\MicroFrameworkPK_v4_0\MyInterops. You may also close the command window now. Now we are ready to start developing, nothing from the above steps will be required again. accept a number of CPU cycles to control the pulse width, accepting -1 to set the state indefinitely. Start the Visual C# Express (resp. Visual Studio) and create a new Micro Framework project of type Class Library, named MyFirstLibrary. Rename the generated Class1.cs to ImpulseSender.cs. Add a reference to the Microsoft.SPOT.Hardware assembly. Go to project properties and check Generate native stubs for internal methods on the .NET Micro Framework tab. In the first textbox you fill a string with which all the names of generated files will begin. As Steve suggests, you should create unique file names across your build. Let it be Tutorial for this walkthrough. The second box just specifies the directory in which the files will be generated. The default should be Stubs; if it is empty, fill it in. If you do not specify any root name, the project name will be used instead. Destination directory is relative to the project's root directory. You can find out by inspection that the ones similar to our class are Tutorial_MyFirstLibrary_ImpulseSender.h, the header file, and Tutorial_MyFirstLibrary_ImpulseSender.cpp, the code file. The code file just sits there and is hungry for our implementation! Note that the Boolean parameter is represented by single byte value. This is because C language does not have any Boolean type. Zero means false and anything else means true. Save the project now, wherever you usually save your projects to. If you are using temporary project feature, you might need to rebuild the project (and rename parameters) once more after saving to get the stubs generated in the newly saved location. You can of course work from the temporary location too. Everytime you generate the stub files, they are marked with a checksum. This checksum is verified at runtime, to see if the managed and native parts match. So it is a good idea to take snapshot of both the managed and native parts you build the firmware with, and keep it saved separately to prevent damages from building the library project accidentally (which would also rewrite the stub files, so any native code entered would get deleted). Create a porting kit folder for your project: C:\MicroFrameworkPK_v4_0\MyInterops\MyFirstLibrary. In that MyFirstLibrary folder, create two folders more: ManagedCode and NativeCode. Open the C# library project we have created above in the explorer (or your favorite file manager). Copy all files in the Bin\Release library folder into the ManagedCode one we have just created. The express products do not have configurations. You might find your files in the Bin\Debug folder instead if doing debug build in big Visual Studio. Update the paths to our snapshot copy and comment the MMP_DAT_CreateDatabase element – it would include the library in the ROM image, which is not very practical during development. $(SPOCLIENT) points to the porting kit installation path, in our case C:\MicroFrameworkPK_v4_0. Save and close the MyFirstLibrary.featureproj file. We will leave the dotNetMF.proj untouched. Open the C:\MicroFrameworkPK_v4_0\Solutions\TAHOEII\TinyCLR\TinyCLR.proj in your favorite xml editor. I've chosen different target when building the RAM firmware, use appropriate paths, i.e. with MERIDIANP resp. TAHOE folders. That's all. Save and close the file. It's a bit more tricky to find out what GPIO_PIN states for (you would eventually find typedef UINT32 GPIO_PIN; in C:\MicroFrameworkPK_v4_0\DeviceCode\Include\tinyhal.h), but it is not necessary to do so, because the OutputPort implementation already has a good clue, as it is converting the parameter to .NumericByRefConst().u4 so one can expect unsigned 4-byte value there, which is what UINT32 is. This is the point where it makes sense to declare the managed pin value as uint to avoid casts burden on the native side. However, as in managed code, we need to tell what or where the CPU_GPIO_SetPinState is. How does the OutputPort class do it? Check the beginning of its code, there is: #include "SPOT_Hardware.h". This is what we need to add, too. Only because we accept an instance of OutputPort in the managed class, we do not need to do the pin initialization and checking. You have to do that if accepting Cpu.Pin directly. That's all – save it and you can also close all the other files we have opened. Note: the waiting cycle we created makes this a blocking call, no other thread will run until it finishes. This should be okay in our case – if you wanted to create a pulse for ten seconds, you could have easily done it in the managed code. I assume we are building for Tahoe-II, if not, replace all the TAHOEII occurrences with your target. Set the evironment variables. Type setenv_gcc C:\CodeSourcery and press enter, confirmation info will appear. Build the (FLASH version of) Tahoe-II firmware. Type buildmf TAHOEII and press enter. The build will start – mine took almost 3 minutes, no errors, 92 warnings. The build number I got is 4.0.40220.34067, you likely have a different one. Pick up the output files. Type release and press enter. This will copy couple of files to the C:\MicroFrameworkPK_v4_0\Release\TAHOEII\TAHOEII_4.0.40220.34067\ directory (think your build number), no error should occur. You can now close the command prompt. Substitute your build number instead of 4.0.40220.34067 everywhere. Connect the Tahoe-II now, if you haven't done already. In the mentioned directory, there are three folders, Bin, FirmwareUpdate_TAHOEII_4.0.40220.34067 and BootRecovery_TAHOEII_4.0.40220.34067. The BootRecovery one is for the case things go wrong and you have to deploy in boot mode over serial cable. 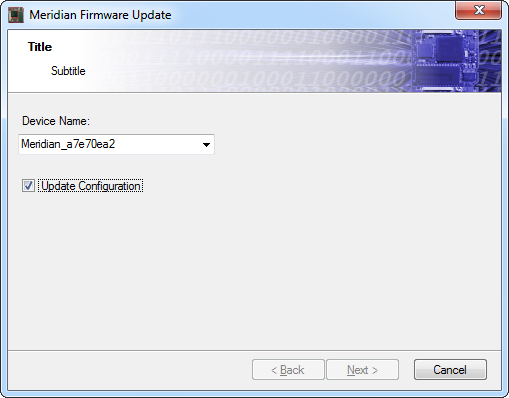 The FirmwareUpdate is the standard firmware update that you can normally download from Device Solutions web. The bin one is the complete output from the build process, which we don't need now. Run the MeridianFirmwareDeploy.exe from the FirmwareUpdate folder. There is a note in the release notes for current BSP that the boot recovery output does not work. Don't try it, I did some nasty tricks with it and eventually broke my board. If you need to do a recovery firmware update, go to the Device Solutions web, download the latest recovery release (even if it was 3.0) and run that one. You will see a wizard's welcome screen. Press next, accept the license terms (if you agree of course) and press next. The auto discovery of devices does not seem to work on this page. If you connected the device later, just restart the wizard. Important: If this is the first time ever you are deploying your firmware build using GCC, check the Update Configuration. You don't need this if you have already deployed your firmware before. The Tahoe-II will now restart (to enter the TinyBooter). Now the device should restart, but does not, only goes black. Failed to connect to device! message box appears. Obviously we must help it with the restart, but we are expected to restart into TinyBooter. You can do that this way: Press SW5 and SW9 together and while keeping them pressed, press the RESET button. The Tahoe-II will restart and you can see the TinyBooter welcome message on the display. Press Retry button on the failure message box. After the longest one, ER_FLASH, it will say Update complete, the wizard will switch to the Finished page after while, but the device will remain black. I suspect the wizard is waiting a while for another restart. You can close the wizard now. Again we need to help with the restart. Press the RESET button on the board. The Tahoe-II blinks some info and goes black again. No worries, press the RESET button again. For successive updates (i.e. without the Update Configuration checked), everything will go fluently without any action needed. To boot into TinyBooter on Meridian/P, hold the user button and restart. Our interop code sends out a pulse over an OutputPort. 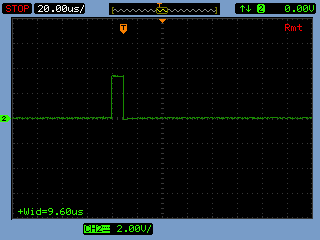 In order to check if it works, you either need to connect a LED with a resistor as described in the managed walkthrough (or use the built-in LED on Meridian/P), or use an oscilloscope. Start the Visual C# Express resp. Visual Studio and create a new Micro Framework project of type Console Application. Add a reference to our snapshot copy C:\MicroFrameworkPK_v4_0\MyInterops\MyFirstLibrary\ManagedCode\MyFirstLibrary.dll (use the Browse tab to locate it). It is important to be this one because it must match exactly the native part we built the firmware with. Add a reference to the Microsoft.SPOT.Hardware assembly in order to access the OutputPort class. The safety pause is not necessary, but it could save you some recovery firmware updates when doing similar experiments. If you do anything wrong, either in managed, but more likely in the native code, you have no chance to catch the board with Visual Studio or MFDeploy again, because the code is automatically immediately executed as you power up or restart the device, without any opportunity to attach the debugger or similar thing. Don't forget to select USB transport type and Meridian_a7e70ea2 device (or other combination for your board) in the project properties. Now enjoy stepping through the code! Please note: such small timings we are producing here are very dependent on whether we run debug or release build, whether a debugger is attached etc. This was done mainly for demonstrative purposes. Now if you want to udpate the native code, you can edit the Tutorial_MyFirstLibrary_ImpulseSender.cpp file and go through the Building your firmware and Deploying your firmware sections again. Hope to see your native libraries soon. Okay, who first does see the problem with above example? Extra points for suggesting a fix. My experience is that the above process does not work using Power Shell (installed Powershell on XP). Is my setup wrong? Process works if I open a VS2008 command Window and then use that as the shell. You need the PowerShell only in step 5 of preparing the environment,, to set the execution policy. All other commands belong to the standard (or Visual Studio) command prompt window. Is that what caused the confusion? yes. I tried to run build cmd scripts in Power Shell prmpt. :-) Thanks for confirming I should be using normal cmd or VS cmd. Do you have any problems running MF programs on TAHOEII after you install the GCC Build of MF4? What about Windows and USB. Do you get errors from Windows during USB PnP device enumeration with GCC build of MF4? Any other problems? I haven't faced any problems with either GCC build or USB PnP so far. The only difference when using GCC is a larger footprint. very nice tutorial :). i ran into problems by using different versions of MF SDK and porting kit, so TAHOEII was not build because of several errors. after using links provided i managed to build TAHOEII :). I tried to run 2 application and one didn't worked with this new build opposed to the latest firmware from device solutions :(.